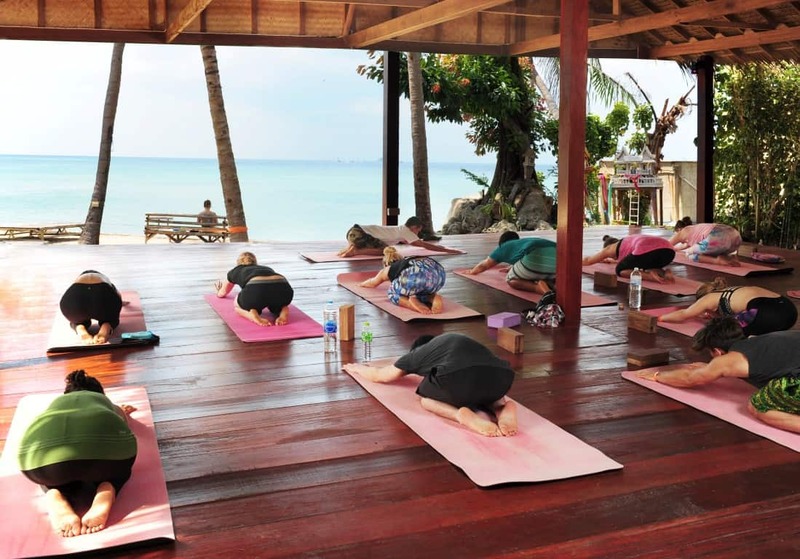 Start a deep journey into your heart whilst you experience an authentic and fun yoga community where you can be yourself, relax and celebrate life. We are an international school of self-realization and spiritual heart of South East Asia. Our Awakening & Healing program®, insignia of our school is the most complete non-dogmatic self-development program in the world. Running throughout the year this program has been created for people who are called to learn to live a happier, more fulfilled and enriched life, based on principles of self-development, acceptance and celebration. It includes Social, Active & Still Meditations, Daily yoga classes, Expressive techniques based on conscious movement and music, Cathartic techniques, Pranayama, Insights to Tantra, Non-Dogmatic Lectures on self-development, compassionate sharing and mindfulness practice. Samma Karuna’s yoga is gentle, spiritual and therapeutic. Suitable both for beginners and experienced practitioners. It incorporates the basis of Hatha Yoga with Vinyasa flow and mindful Ujjayi pranayama allowing the whole process of practice to become mindful and healing. Qi Gong is a practice of mastering Qi in the body (life force energy) through rhythmic breathing, slow and sometimes rapid movement, static poses which are held for a period of time, and deep focus. It has its roots in Chinese medicine and martial arts, dating back some 4,000 years. It is an active meditation in which we use rhythm, awareness, and an intuitive state which are typical qualities of many types of meditation within dancing to reconnect with ourselves and celebrate life. Most famous Social Meditation of Samma Karuna. It is not happy people who are thankful, it is thankful people who are happy. In this love meditation, we will explore the art of seeing light in each other and within ourselves as a true path for a more thankful and happy life. Fifteen stages intense cathartic meditation inspired on Humaniversity AUM meditation and OSHO’s AUM Marathon. Three and a half hours journey of opening up to your emotions, reconnecting with your body and celebrating life. As a school of self-realization our main concern is to help our students finding an authentic and long-lasting happiness. As a non-dogmatic, non-religious school, our aim is to help you develop your own light and wisdom. Understanding that true wisdom comes from within, through our own personal experiences, rather than second hand wisdom found in books or lectures. Our Awakening lectures are based on experiential exercises, time for reflection, sharing, music & meditation. Free weekly event offering a uplifting conscious movie to bring more awareness and understanding to our lives. Based on non-violet communication we learn how to share from your heart, sharing our vulnerabilities to the group and having the courage to be just ourselves. In this process we taking responsibility for our emotions and balance whilst we understand that what make us vulnerable actually make us beautiful. When we hug, our hearts connect and we know that we are not separate beings. Hugging with mindfulness and concentration can bring reconciliation, healing, understanding, joy and great happiness. This meditation is only available at our center in Thailand. Rebirthing is a gentle yet powerful conscious breathing technique. It brings into awareness our unconsciously held beliefs, emotions and the relationships we have with our bodies and ourselves. By birthing with awareness we make possible to resolve, integrate and heal previously unresolved issues in our lives. Breathing is the first act of life. Within the breath is the unexplored secret of life. Sudarshan Kriya is a powerful yet simple rhythmic breathing technique that incorporates specific natural rhythms of the breath, harmonizing the body, mind and emotions.This technique eliminates stress, fatigue and negative emotions such as anger, frustration and depression. Leaving the mind calm and focused, the body energized and completely relaxed. Tantra help us to realize the divine beauty we all have with-in. In this special events we will use the power of breath, movement and touch to connect with our-selves and to others in a fun, loving and playful way. We gather every day to meditate together. Vipassana as taught by S. N. Goenka is a traditional still meditation which is 2500 years old, and considered to be the meditation used by Gautama Buddha to gain enlightenment. All levels are welcome, just bring a respectful and loving energy to the class. If you haven’t meditated before, we may introduce you to anapana meditation technique to get you started. ♥ One to One interviews with a senior teacher to guide you through the program. ♥ Yoga class twice a day. You may change your arrival date later on at no cost.